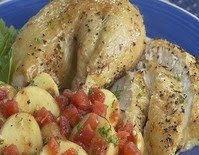 If you are looking for a great roasted chicken recipe to make for your next family dinner, then you should really try this Italian-Style Roasted Chicken recipe by Tupperware. You will want to roast up your whole chicken the day before to save some time. This recipe will make 4-6 hearty servings and if there are any left-overs, they will keep for up to 3 days in the refrigerator. Preheat oven to 450°F. Using a Chef Series™ Pro Chef's Knife, cut potatoes and onion into chunks. Combine potatoes, tomatoes and onion in a baking pan. Drizzle with olive oil, Simple Indulgence™ Italian Herb, salt and pepper then toss to combine. Roast until potatoes are tender about 25-30 minutes. Add chicken during last 10-15 minutes.